Super Typhoon Yutu, the strongest storm on Earth in 2018, slammed into the Northern Mariana Islands in the western Pacific Ocean on Wednesday. The storm savagely battered the islands of Tinian, Saipan and Rota, with the eye completely engulfing Tinian at midday Wednesday. Super Typhoon Yutu is estimated to contain maximum sustained winds of at least 180 miles per hour, with higher gusts. 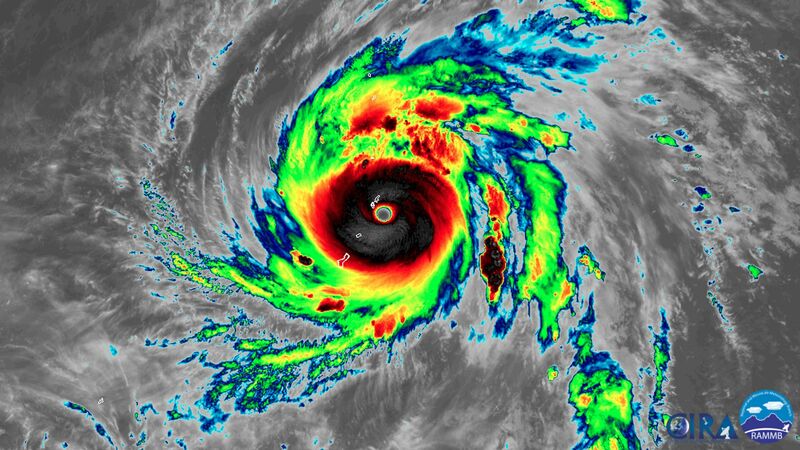 Why it matters: This storm is the strongest typhoon ever to strike the Commonwealth of the Northern Mariana Islands, and likely the strongest ever to strike the U.S. and its territories. “This is an historically significant event,” tweeted Michael Lowry, a FEMA hurricane specialist. Based on satellite data that meteorologists use to estimate storm intensity, Super Typhoon Yutu is one of the strongest tropical cyclones (hurricanes and typhoons) observed on Earth in the modern record, on par with Super Typhoon Haiyan in 2013. That storm devastated the city of Tacloban in the Philippines, killing thousands. Super Typhoon Yutu is located in an area of extremely warm waters and light upper level winds, and is making a run at achieving its maximum potential intensity for that area. Super Typhoon Yutu hits the northern Mariana Islands as one of the strongest-ever storms. Gif: Harry Stevens, Axios Visuals. The details: Yutu is also affecting Guam, which hosts substantial U.S. military installations, such as Anderson Air Force Base. Radar images from that base clearly showed the destructive storm as it moved toward Saipan, which has a population of about 50,000. Tinian and Rota, which with Saipan make up the Northern Mariana Islands, are smaller, with a combined population of about 7,000. Super Typhoon Yutu underwent a period of extremely rapid intensification, going from a 50-mph tropical storm to a 180-mph Category 5 in just 48 hours. More notably, it went from a Category 1 typhoon to a Category 5 in just 24 hours. Emerging research shows that climate change may make rapid intensification a more frequent occurrence. Areas that feel the brunt of the storm will see widespread destruction, on par, if not worse, than what was seen with Hurricane Michael in the Florida Panhandle. The combination of dangerous winds and storm surge flooding can obliterate homes, reducing them to their foundations. The National Weather Service typically warns that areas that experience Category 5 winds of greater than 155 miles per hour could be uninhabitable "for weeks or months." The National Weather Service in Guam predicts that storm surge inundation in Saipan and Rota could reach up to 20 feet above normally dry ground on the eastern sides of the islands. Once the center of the storm passes and winds shift to the southwest, a surge will occur on the western sides of these islands. Seas as high as 30 to 40 feet are forecast just offshore associated with the storm. What's next: Super Typhoon Yutu was at its peak intensity when it hit the Northern Mariana Islands, but it's expected to remain a Category 4 or 5 storm for the next few days. The bottom line: This storm is likely to cause widespread, extreme damage on the small islands of Saipan, Tinian and Rota. Based on satellite measurements, it's at the upper echelon of tropical cyclones observed on the planet since the dawn of the satellite era in the 1960s.